Thanks to a high volume of workload recently and an interest in experimenting with something different, I decided to pick up a camera – a very simple camera. I had gotten my hands on a Konstructor. That’s right a lomography camera. That simply means it is a back to basics 35 mm film camera. So what is the Konstructor like? The Konstructor does not provide much in modern conveniences. It has no auto focus. Focus is done by hand and although it allows for some close-up work, it is not as easy to work with using the top-down viewing window. What it is however is discreet compared to the a contemporary DSLR. Drawing the camera to the eye always draws attention to the photographer but a waist high viewing camera on the other hand doesn’t draw as much attention. Another area were convenience is lacking is metering. Metering has to do be done by an external light meter. Thankfully, I have been able to make use of a light meter app on my phone. I don’t expect it to be absolutely perfect, it doesn’t need to be. But, it needs to help me determine whether there is sufficient light to make the shot. A fixed shutter speed of 1/80 s is another thing to look out for. It is not an inconvenience. After all, a faster shutter speed means less shake. But, it also means I either need significant amounts of light if I am making use of film with a low ISO or simply opt for a higher ISO film. The one setback I have experienced with this is that I am limited to taking shots around noon. This is especially so during winter because the skies are usually overcast. Sunny days are far and few between and even then the sun only shows in spurts. The last issue which is a little inconvenient is the fixed aperture of F/10. Don’t get me wrong, I love my images tack sharp and with a plastic lens like the one fitted to this camera it needs to be dialed down to give the best results. But, like the fixed shutter speed, it requires either large amounts of light or higher ISO film to be effective. The limitations the camera imposes require some skill and patience to work around but it is doable so long as you are willing to commit to learning it. It also means that you have to rely on some external instruments to help determine when to take your pictures. But, the experience simplifies the photography process and encourages the user to get back to basics. And, overall, makes for a very rewarding experience. P.S. 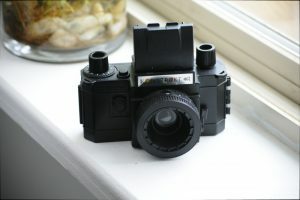 : I am keeping my fingers crossed once I have the film developed.